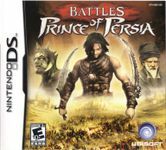 Follow the Prince on his harrowing journey in a Prince of Persia story that has never been told before. Lead your army through the untold wars and become a master of the battlefield. Play as one of nine generals and command the mighty armies of ancient Persia, India, or Aresura. Beat impossible odds on the battlefield by collecting, purchasing, and strategically trading more than 200 cards. Test new tactics and forces when you challenge friends to two fully customizable multiplayer Versus modes.